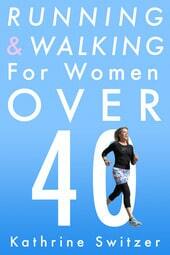 RUNNING AND WALKING FOR WOMEN OVER 40 (e-book edition, Diversion Books) An indispensable and encouraging guide for every woman looking for a fun, easy and economical route to fitness & health. Women’s fitness pioneer Kathrine Switzer has been on her feet for 53 years. She knows how running or walking is the fastest, easiest, and least expensive road to fitness for women of any age. For women over forty in particular, it’s vital to fit an exercise regimen into their busy lives, and ensure they can stay active and healthy for many years to come. No matter how inexperienced or old you are, Switzer will guide and ease you into a new exercise schedule, showing how this time you give yourself will be the best part of your day…and your future life. Recommendations for shoes, clothing, injury prevention, nutrition, motivation and finding the time in your life will keep you exercising safely and comfortably. For women over forty, Kathrine Switzer’s expert running and walking programs are specifically designed for you, enabling you to keep healthy and enjoying life to the fullest for decades to come.